Welcome :: DBA Alarm & Security, Inc.
DBA Alarm & Security, Inc.
customized systems in a timely, cost effective manner. 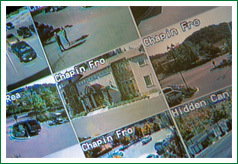 At DBA Alarm and Security, we sell and install the finest state-of-the-art commercial and residential security systems. We’ve built our business based on belief that customers deserve the best value for their security dollar. Our team of professionals consists of highly trained experts who are willing to work hard for your business. To be a leader in the electronic security equipment leasing, sales, installation, monitoring and service businesses in the Central Coast area, featuring high quality products and a commitment to customer service to generate and maintain a distinctive competitive advantage in the marketplace. If you are interested in discussing your alarm and security needs with one of our commercial specialists please give us a call at (831) 422-8308. The DBA staff, consisting of electrical engineers, designers and installers, has 22 years of experience in the field of commercial, industrial and residential security and surveillance. We are dedicated to providing you with the highest quality products and services the electrical industry has to offer. DBA Electric is a licensed general electrical contractor, installer, automation control systems designer and manufacturer. We provide engineered solutions, servicing the commercial and agricultural industries, as well as the residential sector. 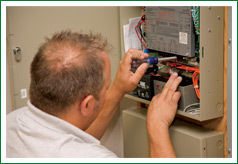 We are C-10 licensed and one of the few UL-approved electrical companies on the Central Coast. If you have any questions or comments or are just interested in more information, send us an email and we would be happy to respond.